It was a long day last Saturday and I know I was in for a treat. I got a chance to watch back to back theater plays from Tanghalang Ateneo's Janus Silang at ang Tiyanak ng Tabon and Sugid Productions Inc.' Buwan at Baril sa Eb Major. 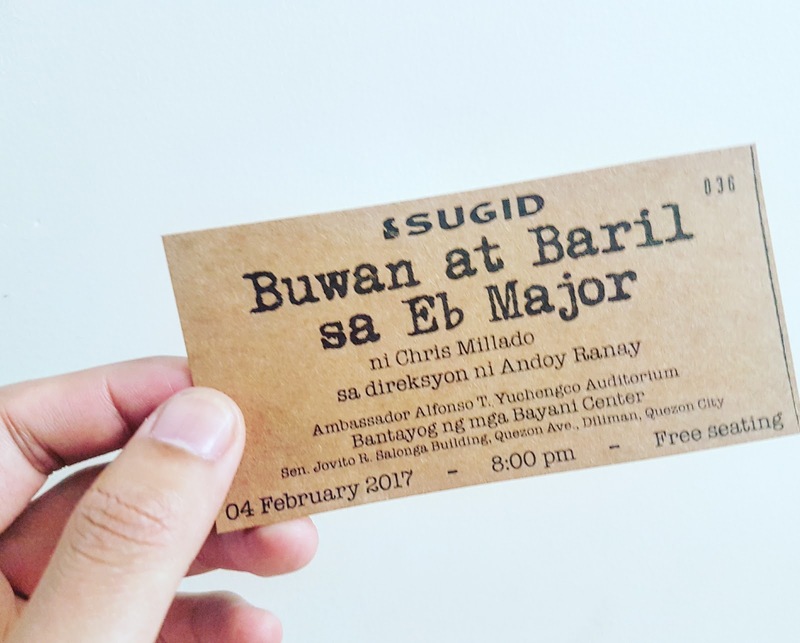 Did you know that Chris Millado's Buwan at Baril sa Eb Major was written on the year 1985 and was originally directed and designed by Apo Chua, with the Philippine Educational Theater Association (PETA) producing it at the Rajah Sulayman Theater, Fort Santiago in Intramuros, Manila. After more than 3 decades, this material is still relevant! Sugid Productions Incorporated took a leap for re-staging Buwan at Baril sa Eb Major as their very first production for their first performance season. It has 5 stories which tackles different experiences during the Martial Law regime. The Manggagawa (Worker), in the first story, long estranged from his family, meets his brother, Magsasaka (Peasant), in one of the pit stops of the historic May 1984 Lakbayan (People’s March). Their conditions and the reasons for joining the long march set the tone and theme of the entire play. The Priest, in the second part, takes care of the refugees, represented by the Babaeng Itawis, who flew from their ancestral lands in the countryside after a military operation. The two talk with the members of the media and a fact finding team where the cruelty experienced by the indigenous people under militarization is revealed. The Socialite, in the next segment, rehearses her part as a member of the negotiating panel as she prepares for a rally. This bourgeoisie, awakened by prevalent injustice, illustrates how the middle class views the marginalized sector of society and sympathizes with their need for change. The Wife identifies the body of her husband, an NPA guerilla, and continues in a horrific narrative of capture and detention. She talks to his lifeless body, recalling their story of struggle and survival. The Police Officer arrests and interrogates a Student in the final segment. Their exchange is intense as they struggle to outsmart each other. The police officer eventually releases the student, only to find out later that he was charmed and outsmarted by a most wanted activist. The Socialite stars Jacky Lou Blanco. I am amazed and surprised with her portrayal. It's believable, outstanding and will make you laugh out loud. The shifting of emotions was on point. She made me laugh and cry at the same time. I wish to see her more on stage. The Priest was played by JC Santos and Itawis Girl by Angeli Bayani. Two seasoned artists whom passion for theater acting is overflowing. JC's eyes still his best asset. He can deliver powerful emotions with his stare. Angeli, on the other hand, played her character with such gravity. I got goosebumps during her struggles. 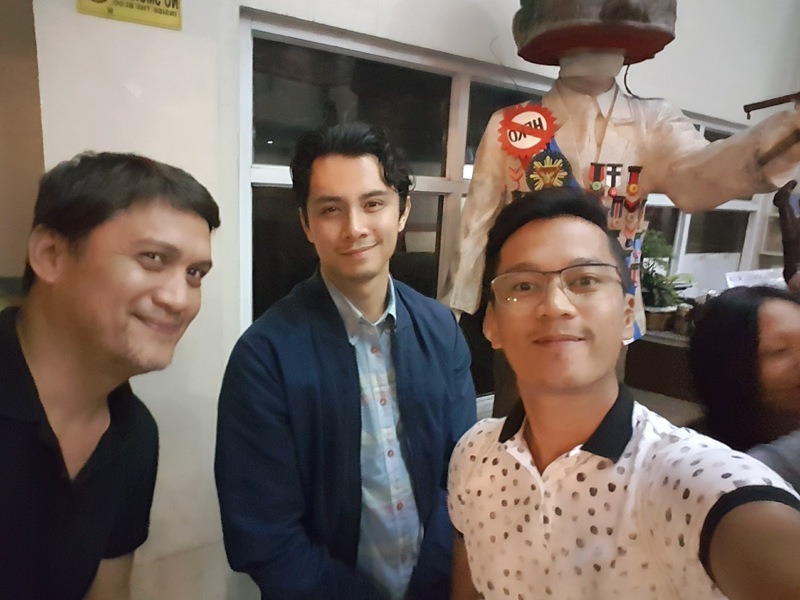 Ross Pesigan and Joel Saracho have a great chemistry as police officer and student. I am quite lost on the story of the Wife, Cherry Pie Picache's piece. I didn't connect much with the Worker and the Peasant story so I am ranking it last. Awesome performance from JC Santos as usual! Hello there Direk Andoy! 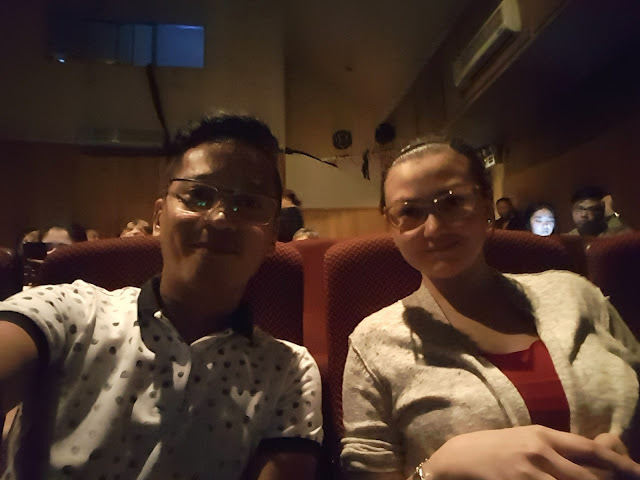 Angellica Panganiban supporting Filipino theater! 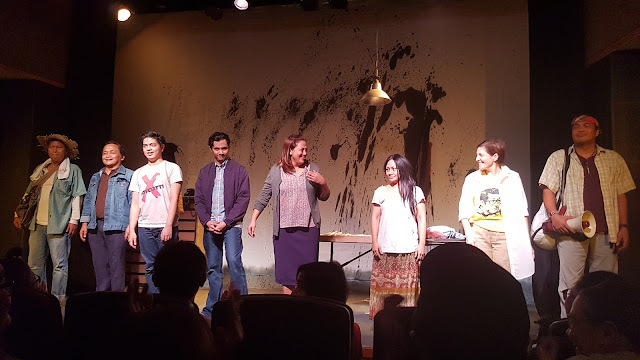 Buwan at Baril sa Eb Major will run until February 12 with shows at 3pm and 8pm. 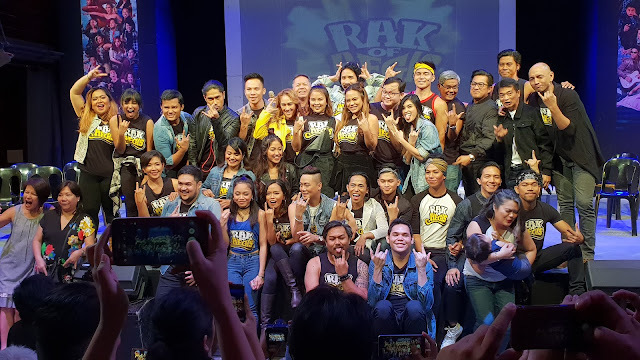 The funds raised from the performances aims to bring this production to colleges, universities and local government units in Metro Manila and the provinces. For ticket inquiries, please call or text Gian Viatka at 0917 845 6200. 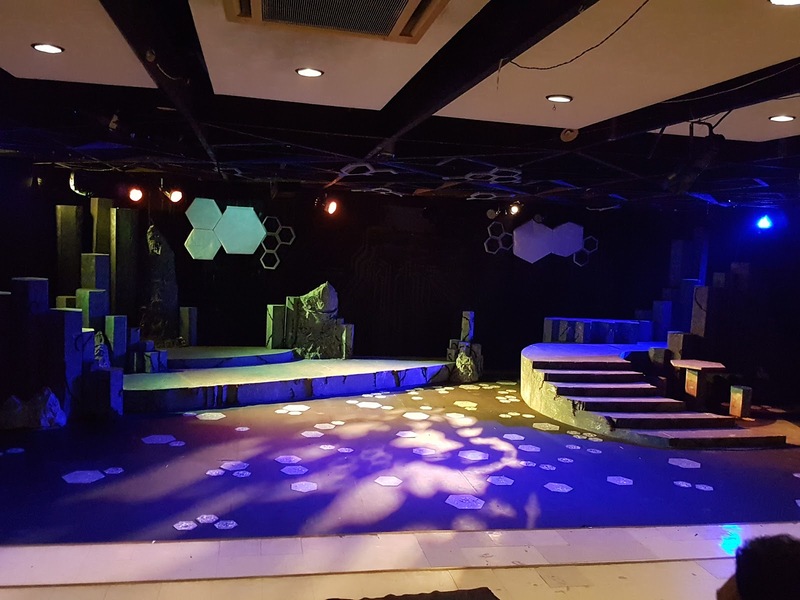 When you talk about best school-based theater in the country, Tanghalang Ateneo is always on the top of my list. They always bring something new to the table with relevant material, amazing cast and crew and very high production value plays. Janus Silang at ang Tiyanak ng Tabon is written by Edgar Calabia Samar who is a Palanca awardee. It won 2015 National Book Award for Novel in Filipino and 2016 National Children's Book Award for Best Read for Kids. Before it was put into play, Janus Silang at ang Tiyanak ng Tabon was already well-received by Filipino novel enthusiasts. 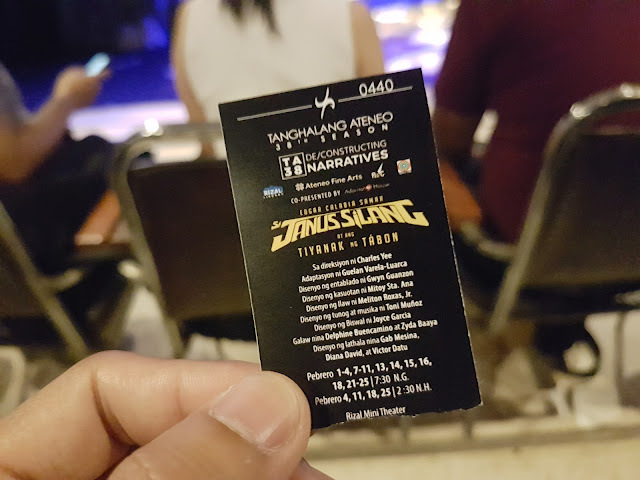 I am giving you 3 more reasons why you should watch the staging of Tanghalang Ateneo's Janus Silang at ang Tiyanak ng Tabon! The material talks not only about the Tiyanak ng Tabon but also added other Filipino folklore creatures like Tikbalang etc. Mitoy Sta. Ana is the mastermind behind the creepy creatures who made it so believable. I really felt scared and just peeping through the spaces between my hands. It's that creepy and scary! I got a chance to ask Gwyn about his inspiration and the creative process how he came up with the stage design. 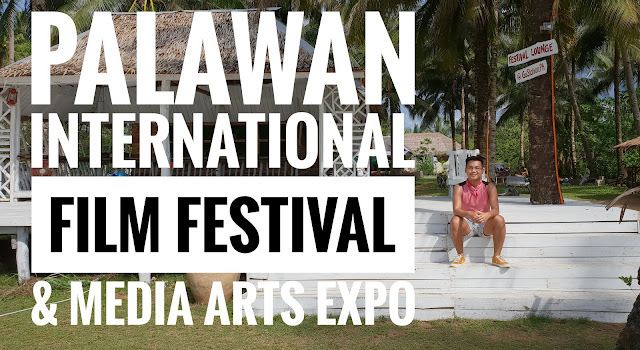 He shared that it was the fourth draft since Charles Yee, the director, wanted to have a cave as the story talks about the Tabon Cave situated in Palawan. Since there's a computer element in the story, he thought of using binary boards. It served as a background and accented with different colors which worked with the totality of the visuals. He also shared how they abused using hexagons. Projections, elevations and even the floors have it. 3. It will have a television adaptation! Janus Silang at ang Tiyanak ng Tabon will be aired in ABS-CBN later this year. Having said that, it only depicts that it's really worth your time! Any guess who will be playing the lead role of Janus? 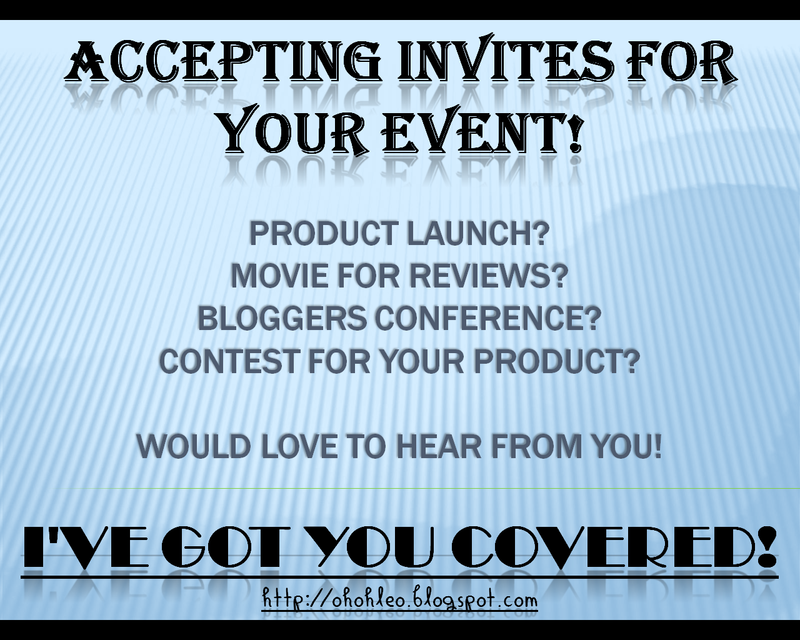 Looking forward for your feedback! 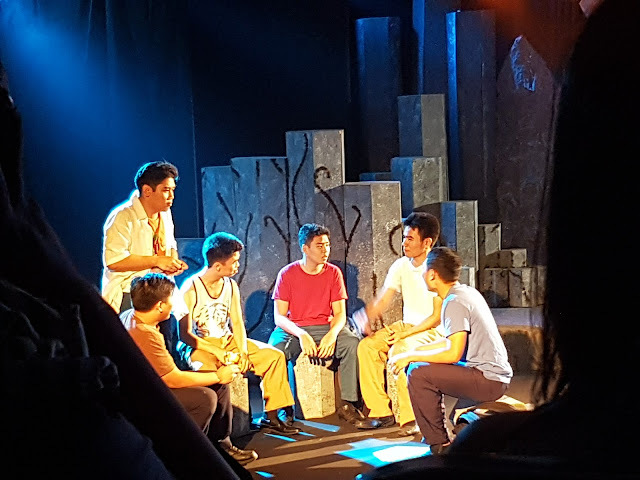 Janus Silang at ang Tiyanak ng Tabon will run until February 25 with 7:30 and 2:30 shows. For questions and additional details about the show, please contact Dean Silva at 0916-314-5475. Hope to see you at the theater!